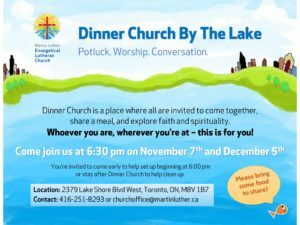 Dinner Church by the Lake at 6:30 pm. This includes a potluck, worship and conversation. Please bring food to share and come early to help set up or stay afterwards to help clean up. Sign up today! Find a new way to church!